What letter to send to give Formal Notice of Dissolution a Partnership? 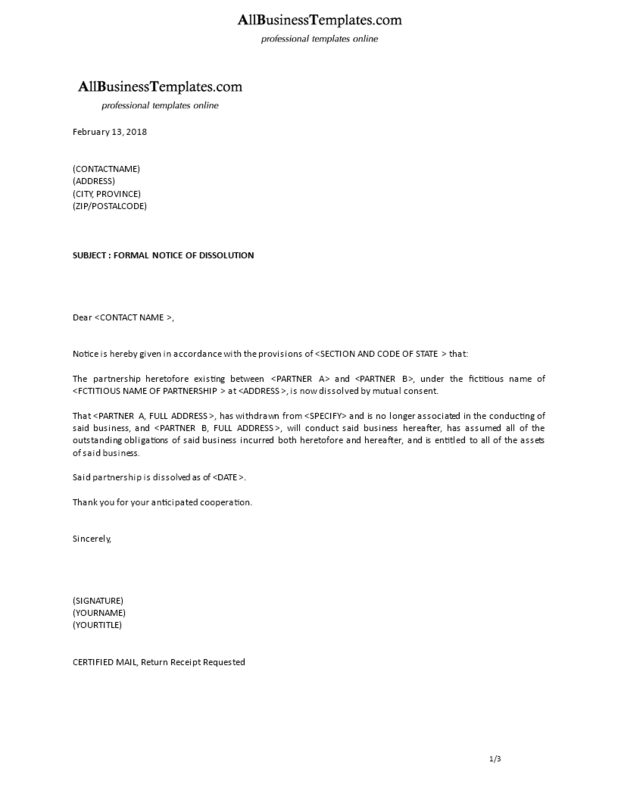 Download this Formal Notice of Dissolution Partnership template now! Are you in the situation you are in a partnership that will be terminated on the short term? Download our Formal Notice of Dissolution now if you need to dissolve a partnership by mutual consent. You can send a signed copy of this formal notice to your partner to declare the partnership is dissolved. Try out our online Free and Premium Professional templates, forms and contracts today. Download this Formal Notice of Dissolution Partnership template and after downloading you can craft and customize every detail of its appearance very quickly. Using our Formal Notice Letter guarantees you will safe time, costs and efforts!